This morning the kids and I surprised their teachers with breakfast! 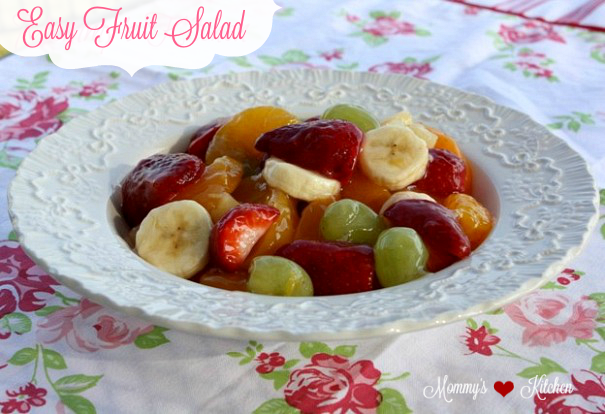 We made sausage Cream Cheese Crescents, and this wonderful Easy Fruit Salad. Our teachers do so much for our children, I thought it would be nice to surprise them and say thank you. What better way than with Breakfast. I wanted them to know just how much we appreciate them and all that they do. I got this recipe years back from a friend, I had made it once before but had forgotten about it. This fruit salad is actually a diabetic recipe. All I know is that my kids love this stuff. I did not think they would, but they couldn't get enough of it. Now I need to make another bowl this weekend just for us. You can use any fruits that are in season, plus you can change the pie filling from peach to apricot or even apple. Peach is always my favorite. This recipe utilizes fresh strawberries, but if you want to make salad when strawberries are not in season you can use frozen. This salad is a perfect addition to any breakfast, brunch, or barbecue really any special occasion. It makes a pretty good amount, so there is plenty to go around. Just toss everything together and let it chill until ready to serve. It doesn't get any easier than that. here is my little helper showing me how strong he is. Carson said he could hold the bowl all by himself. Add all the ingredients together in a large bowl. (Make sure to drain the pineapple and the mandarin oranges) Gently mix everything, cover and refrigerate until ready to serve. Drain the mandarin oranges and pineapple, set aside. Gently mix all the ingredients together adding the pie filling last. Cook's Note: If you're making this for a large crowd I would double the recipe. Also if strawberries are not in season frozen strawberries can be used. This looks absolutely DELICIOUS! I just LOVE fruit! That looks amazing! You never fail me! Every post looks awesome! Thank so much Joan, I always love your comments. Tiffany, you gotta try this if my kids like it then anyone will. My kids are so picky. Tina, I have bee trying to figure out how to get the "Print This Recipe" function added to my posts, but nothing has worked. How did you get it to work for you? Thanks for stopping by my website. I'm glad I came to visit yours. This seems like such an easy, yummy, healthy recipe. Thanks! And how nice of y'all to surprise their teachers. Tina, you are such a sweetie to do this for your kid's teachers. I'm sure they were quite pleased. It looks yummy. Will I be getting some in the mail???? I love fruit salad. Love your blog....I agree with your moto. I am a stay at home mom who loves to cook and bake for my family. I always have the kids in the kitchen to help. I even brought their lil kitchen into my kitchen. Hope you come and visit. Hi! How do you keep the bananas from turning brown? Whenever I add a small amount of lemon my kids tastes it and complains. Great looking fruit salad! This was so good. I made it for family's birthday celebration this weekend and it was a hit. To keep bananas and apples from turning brown, you can coat them in orange juice instead of lemon juice. I put a little juice in a plastic bag, add the fruit, shake gently and then drain the juice.